It is replaced by the APG Series 4000. APG's Series 6000C - A POS cash drawer that works as good as it looks. 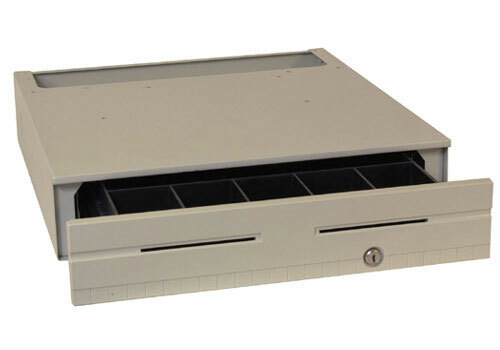 The APG Series 6000C family of rugged, attractive cash drawers provides a unique foundation for the POS Workstation. The Series 6000C drawer works well in applications such as automotive, specialty retail, and convenience stores that demand a sharp, low-profile look and rugged, fully featured performance. All Series 6000C drawers offer dual media slots with spacious media storage and innovative under-till coin roll storage. A sturdy, steel-backed plastic drawer front presents an eye-pleasing alternative to metal. 20" W x 20" D x 4.46" H, Serial interface. Includes cables & dual media slot. Color: white. 20" W x 22" D x 4.46" H, MultiPRO I interface (for all 24V printers & terminals). Includes dual media slot. Order cables separately. See accessories. Color: white. 20" W x 20" D x 4.46" H, MultiPRO I interface (for all 24V printers & terminals). Includes dual media slot. Order cables separately. See accessories. Color: white. 20" W x 16.7" D x 4.46" H, MultiPRO I interface (for all 24V printers & terminals). Includes dual media slot. Order cables separately. See accessories. Color: white.